The "Battle of George Square" was a confrontation in Glasgow, in which the Glasgow City Police sought to violently suppress striking Glasgow workers, centred around George Square. The confrontation, also known as "Bloody Friday", took place on Friday, January 31, 1919, 82 days after the end of the First World War. Around 50,000 workers were striking to demand a reduction of the working week and were met with police batons. The Riot Act was read for one of the last times, declaring the gathering unlawful and ordering the crowds to disperse. However, the paper was snatched out of the sheriff's hand and the city's superintendent had to finish reading it. The red flag was seen proudly flying in George Square. The fighting raged all over the square and in adjacent streets. In North Frederick Street, the police were driven back when the strikers seized a lorry full of empty bottles and used them as missiles. The strikers withdrew to Glasgow Green where fighting continued with police. Sporadic fighting went on late into the night in some neighbourhoods. In the aftermath of the Battle, the leaders of the strike were arrested and British troops, supported by six tanks, were moved to key points in Glasgow and its surrounding areas. About 100,000 demobilised men had come back from the inter-imperialist World War I to a Scotland of unemployment, exploitation and slum housing. The protesters were in George Square to hear the Lord Provost's reply to a workers' demand for a 40-hour week instead of the average 57 hours. 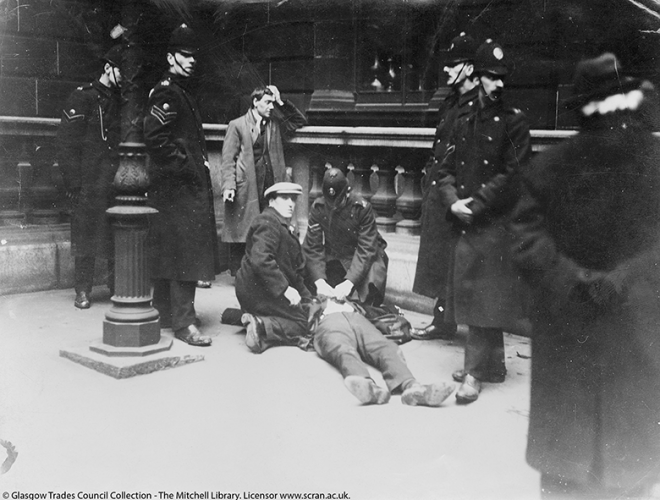 As they waited for the delegates to return from meeting the Lord Provost, Glasgow City police launched a vicious and unprovoked attack on the workers. They beat men, women and children to the ground. At the request of the Sheriff of Lanarkshire in response to the violence, some 10,000 troops were deployed, with machine gun posts set up on top of high buildings around George Square, the Post Office and North British Hotel, and tanks were despatched. 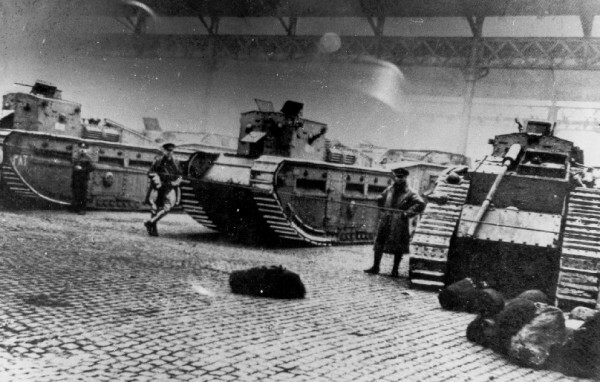 Tanks at the Glasgow cattle market - Battle of George Square. In the immediate aftermath, the joint Strike Committee of the 40 Hours Movement called for workers across Britain to rally. Their leaflet read: "The organised workers of Scotland put forward an orderly and legitimate demand for the Forty Hours. The government's reply is bludgeons, machine guns, bayonets and tanks. The institution of a reign of terror." It called on workers throughout Britain to stand "shoulder to shoulder" with the Clyde to "prove that organised labour is a force to be reckoned with, not something to be despised and broken". The battle in Glasgow was soon followed by other actions in South Shields, Salford, London, Hull, Liverpool, Newport, Cardiff and Barry. The impetus was not only the conditions of the workers of Scotland, Wales and England, but also the movement which had grown in opposition to the slaughter of the First World War, and the inspiration of the October Revolution of 1917 in Russia, with the formation of a workers' government there. In these circumstances, the Secretary of State for Scotland, Robert Munro, condemned the demonstration of the 40-hour movement as a "Bolshevist uprising". Furthermore, to divert this movement and to attempt to divide the workers, it seems likely that the state itself was the motive force behind so-called "race riots" which preceded the Battle of George Square, also occurring in similar contexts in South Shields and elsewhere. During the First World War, Glasgow had played a crucial role in providing the British Navy with ships and submarines, and met the constant demand for munitions. But in tandem with this, the workers took action throughout the war years, striking in factories, mines and shipyards. Opposition to the war and to its economic effects had famously continued amongst the workers in the munitions factories. 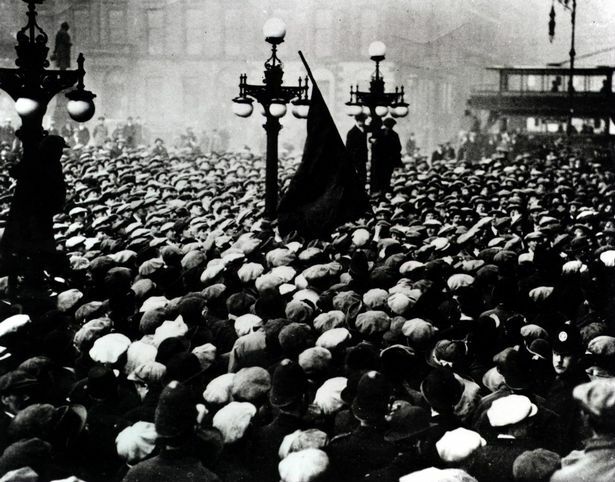 As early as 1915, over 10,000 workers in Glasgow took unofficial strike action against the attacks on their living standards. Fifteen establishments were involved, including large armament firms, and overtime ceased on war contracts. A ballot on March 9 led to shops coming out on strike. Local shop stewards organised what became the Clyde Workers' Committee, with hundreds of delegates elected directly from the workplace meeting on a weekly basis. In addition, the Clydeside Rent Strike of 1915 saw organisations like the South Govan Housing Association take action. The introduction of the Munitions of War Act in the same year added more discontentment. The Act allowed lower skilled workers opportunities to perform work that would usually require someone with much higher skill. It allowed employers to increase working hours and cap wages. Tensions between the government and Glasgow's working class continued to grow throughout the war years, coming to a head soon after the Armistice. John Maclean, writing of this period of "Red Clydeside" during the First World War, said: "Our conclusion is that in our fight for freedom we are right up against it in all parts of the world, no matter what the nominal owners of the place we live in may be. Let us then be part of the international workers, organise to overthrow the organised capitalist class of the world."